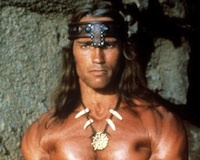 The Legend of Conan is still in the planning stages right now, but if Arnold Schwarzenegger’s enthusiasm is an indicator, the film might actually see the light of day. If the film does get the greenlight, producer Fredrik Malmberg revealed their dream is to have Peter Jackson’s WETA workshop provide special effects (via TheArnoldFans.com). As of this writing, Arnold Schwarzenegger is 65 years old, but that’s not stopping him from wanting to do this movie. He says he feels like he did when the original Conan was made. The film is said to be a direct sequel to 1984’s Conan the Barbarian and will ignore the events of both Conan the Destroyer and of the most recent reboot, 2011’s Conan the Barbarian, which features “Game of Thrones” star Jason Momoa in the lead. Universal is aiming for a 2014 release.